As part of the “Social-Ecological Resilience for Sustainable Development” master’s programme at the Stockholm Resilience Center, I studied the seafood flow from marine ecosystems to different market demands. 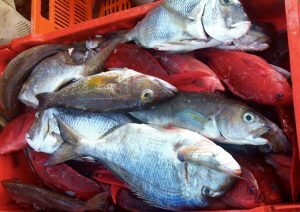 The study mapped a finfish supply chain in Baja California Sur, Mexico, that spans from actors such as fishers in rural fishing communities and fish buyers, to finally reach diverse market demands (e.g. local or international markets). In addition to preparing a scientific publication resulting from the study, I worked closely with DataMares, a science communication web platform, where the challenge was to design a story and an infogram able to communicate the complexity of this trading system to a wider audience. Communicating the complexity of Social-Ecological Systems is important to bring to the ground our understanding of the diversity, structures and processes that characterize and influence the behavior of these systems. The aim of this online publication was to communicate the findings of this study in a different way, in a way that can be read and shared by the general public and stakeholders working in fisheries and marine sectors in Baja California Sur. This effort allowed bringing back the findings to our local collaborators and participants of the study, but at the same time, working closely with designers and professionals in communication helped becoming more explicit and aware of the assumptions behind the study.